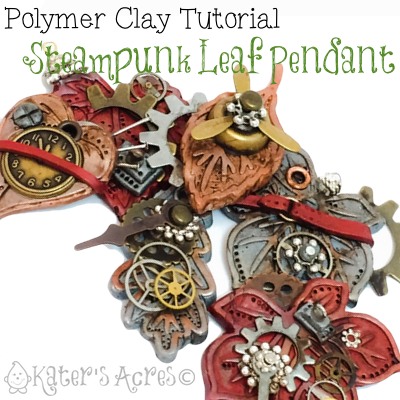 These steampunk leaf pendants are trendy and whip up quick. Make as many as you’d like for yourself and all your friends. Enjoy! From Steampunk Fall Leaf Pendants Video Tutorial from B’Sue & Me. Grab some coffee & enjoy. Bake your steampunk fall leaves for 45-60 minutes at 275 degrees. After your leaves have been baked add a wash of acrylic paint. Coat of varnish if you choose. Pop back into a 200 degree oven for 20 minutes to dry out & seal the paint & varnish coatings. Free polymer clay tutorials are made possible by Whimsical Sculpture Tutorial Club Members. Next post: What’s in My Top Drawer? Thank you both for this video. Love the ideas. I didnt know they didnt make that color anymore but I think I have some left. It such a pretty color why would they stop making it?? Cant wait to try this!